Learning to use evaporation starts very early in chemistry. For students, the process takes a very simple approach, maybe just putting a solution in a beaker over a flame and waiting. That technique, though, doesn’t provide the sophistication, control, or throughput that advanced techniques require. Consequently, scientists can use dedicated evaporators. Click here to read more about Evaporators. IntelliCyt offers a suite of reagents and kits that, when used in combination with our high throughput flow instrument technology, provide a screening solution for cell and bead based assays. MultiCyt® cellular assay reagents include those for monitoring cell health and for multiplexing using a cell encoding system. Cell health screens can monitor a variety of endpoints including proliferation, membrane integrity, apoptosis and genotoxicity. Read more about the MultiCyt Cellular Assays on the Intellicyt website. The PHERAstar FS is the ultimate multi-mode reader for high-throughput screening, combining the highest sensitivity with the fastest read times. 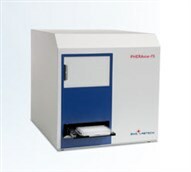 Thanks to the unique Optic Module system, Simultaneous Dual Emission, UV/Vis spectrometer, and dedicated AlphaScreen® and TRF Lasers, whatever your application, the PHERAstar FS will perform it with ease and speed, even in 3456-well microplates. I'm trying to run a fluorescence output assay but there is a lot of well to well variation. Slit or beam width is only 2mm. Is it possible to increase? Advise this member. I have used the synergy HT for some years and with very good results. My question is, can I can monitor closed plates i.e sterile plates that I want to monitor while the cells are growing. Advise this member. Measuring just 135 x 41 x 30mm and weighing only 80g, this small lightweight device is practical to carry around, easy-to-use and can read any 1D barcode or 2D Data-Matrix code on 24-, 48- and 96-well format tubes and racks. Due to its compact size and wireless operation - the Handheld Wireless Scanner MINI offers convenient, high performance scanning anywhere where you might need it. Read more. Wetzlar, Germany. Leica Microsystems launches the Fluorescence Recovery After Photobleaching (FRAP) device for widefield microscopy, Leica WF FRAP. The device is made for the investigation of cellular dynamics and provides users the flexibility to define their bleaching area using masks of various sizes and shapes. Read more. Electric Ice Trays from tecaLAB are an affordable option for easy bench top cooling. The compact Peltier design allows for maintenance free, constant cooling. Simply plug it in and cool to as low as 25C below ambient. Electric Ice Trays can be run continuously, 24/7. The Electric Ice Tray is an economical replacement for ice baths. Read more. Thank you Heidolph North America for sponsoring the Evaporators/Concentrators category on LabWrench. As an innovative and globally active company, we focus on providing premium laboratory equipment to top scientific minds in the pharmaceutical research, cosmetics, biology, bio-fuel and chemical industries. These products include being the category leader in Rotary Evaporators and Overhead Stirrers along with Hotplates, BenchTop Shakers, Homogenizers, and Peristaltic Pumps. We also provide Sterilizers, Synthesis Solutions and Fume Hoods. Our team based out of the Chicago area is dedicated to providing top customer service and technical support to the US and Canadian laboratory equipment market. We have 11 outside sales specialists providing the customer with application support, demonstrations, set up and training and on-site service checks. Visit the Heidolph North America website to view their full line of products. I have a problem with my GC. During calibration there is a problem with the carrier gas flow. The column flow is OK but the total flow can’t be keep at constant level and vary from 15 ml/min to 50 ml/min. Can anyone tell me what I should do? Advise this member. Does anyone know what is going on with the instrument when it reports and "error 61 a" message Advise this member. I'm having a problem when the fraction collector turns to change the collection tube, the delivery arm doesn't detect the next tube and the system sends me a 61 error message. Advise this member.